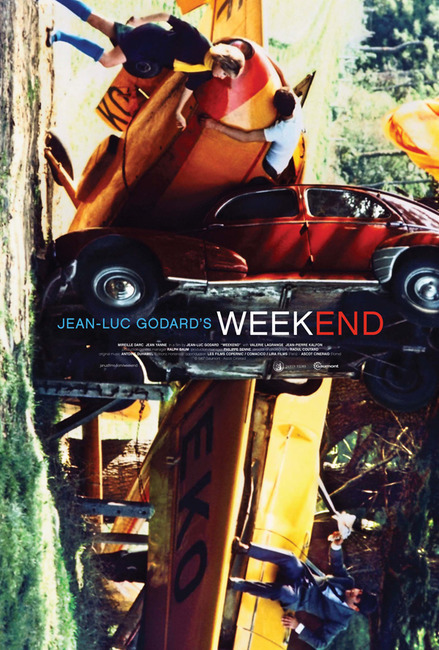 For Janus Films’ new print of Jean-Luc Godard’s Weekend, which starts showing today, designer Steve Chow created an eye-catching poster that vividly captures that New Wave battering ram’s apocalyptic, sideways vision. 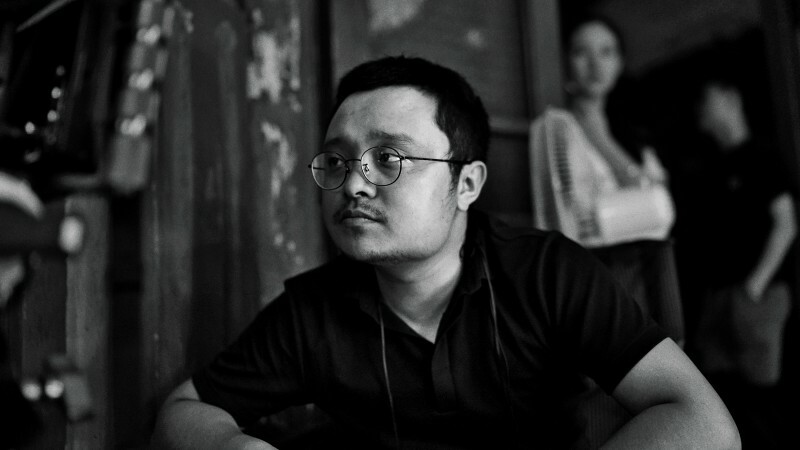 This is the third Godard design that Chow has done for the company, following his striking compositions for Vivre sa vie and Pierrot le fou. On the occasion of Weekend’s theatrical rerelease, we asked the Vancouver-based graphic designer a few questions about his work. What was your inspiration for the new poster for Weekend? 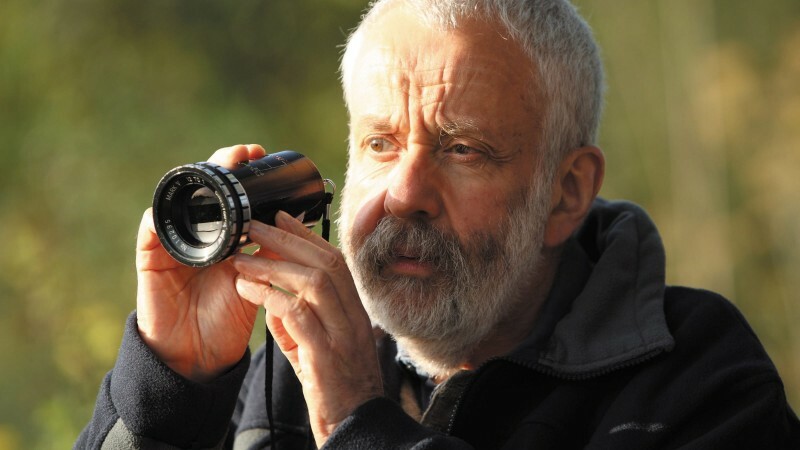 Where does your interest in Godard films come from? Godard’s influence is everywhere—in contemporary advertising, commercials, music videos. 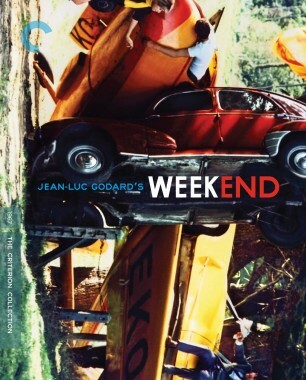 You could be watching something that is “Godard” and not even realize it. (Just the other night, I saw a new Mexican film that riffed on Anna Karina’s back-of-the-head introduction in Vivre sa vie.) His 1960s works, in particular, still resonate with so much life and excitement. So daring, and so very, very cool, even decades later. Do you have a particular approach to designing for them? With all of these Godard posters, I pretty much tried to just get out of the way and let the image speak for itself, and in the end, the most intuitive options were successful. With Pierrot le fou and Vivre sa vie, the resonance of those particular images is strong; title treatments that are too heavy or that get too much attention wouldn’t help tell their stories. Similarly, for Weekend, we’d have a hard time creating an image or a collage that captured the crazy, chaotic energy and direction of the film as well as the one we ended up using. So, with regards to these three posters, if I never hear “Wow, that’s a killer title treatment!” I’ll consider that a success.